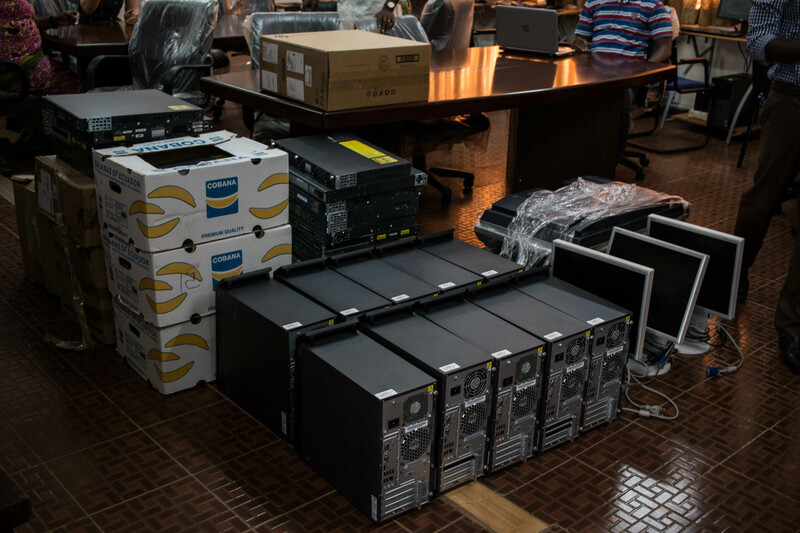 There was a joyful moment when Aurora, in collaboration with Arion Bank and Samskip, donated 10 Computers, 5 large Screens and various other IT equipment to the University of Sierra Leone. The donation marked the start of Aurora´s new Computer Project, but the second Free Computer Training Project this year is starting soon. This project is a collaboration between Aurora and iDT Labs in Sierra Leone and Arion Bank and Samskip in Iceland. Arion Bank has donated a substantial amount of computers and other IT equipment, and Samskip continued their support from earlier in the year and donated a computer and various IT equipment again this time as well as providing Aurora with a free shipment of the goods from Reykjavik to Freetown. Part of the project this time was to donate computers and other important IT equipment to the University of Sierra Leone. Dr. Fatmatta B. Taqi a Director of Academic and Career Advisory & Counseling Services and Miss Antoinette Turay a senior admin assistant received the equipment on behalf of the University and expressed the gratitude of the University IT department, but IT equipment in the University three faculties are really scarce. The University of Sierra Leone is the oldest University in West Africa, established in 1827, and will soon celebrate its 190th birthday.